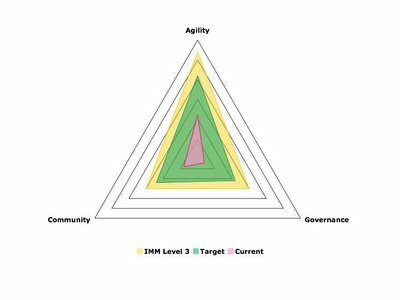 The Agile Manager: An "Innovation Maturity Model?" This is, clearly, going to be a bit involved, but it gives us useful information. The extent to which the different practices are performed will be a strong indicator of our organisation’s aptitude for innovation. In addition, having a “maturity flight” for each will highlight strengths and deficiencies in how we operate now. This, in turn, allows us to focus our efforts and investments specifically where it will make us more competitive. Having a “Level -1” is useful from the point of view that there is value in calling out practices that inhibit innovation. A Level 3 might be thought of as a maximum degree of facilitation. Between are varying degrees to which things are done that engender innovation but are suboptimal in a purely “innovation” context. This is not to say that Level 3 should be the target: there may be economic or operational reality why an organization peaks at level 2 or 1. This is also not to say that there are not levels beyond 3, but for purposes of constructing an initial model, it is best to keep it simple. Bear in mind that this is simply a model that provides us a structured way to analyse what we’re doing now and suggest what we should be doing instead. With a taxonomy, and a series of practices, we should be able to construct a “maturity flight” for each practice, sequencing activity in degree order to which each engenders innovation. And so on, for all practices. Map the affinity that we have for innovation. Track our progress as we improve our ability to innovate. Of course, with as many as 19 practice areas identified, this is going to produce a lot of data. 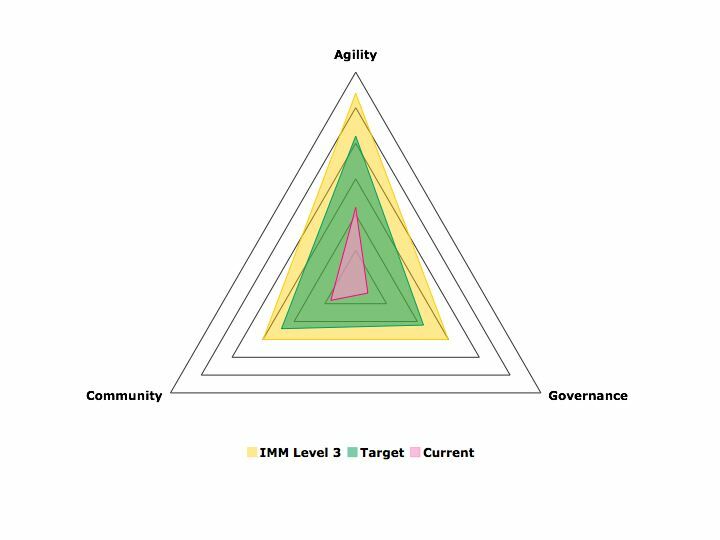 As we have an index and a categorization for each, we can consolidate our scores and get an overall assessment of our Agility, Community and Governance practices.